I was unable to make it to my 200 hit party so I will have another 7/26/08 at 9:00 central time at the dojo on ice palace. Make sure you bring your instruments so we can make a band for the party! P.S. I almost have 300 hits! Over the past couple of days I have not posted anything.I was not at home! I need someone to help me when I’m gone!The first one to tell me what color my penguin is right now gets to be my helper! Hey, the new pin came out today! It is at the pool! And thanks for the pics from my friend tooly! I’ve gotten 200 hits now! The party will be combined with the 100 hits and the date will be changed to friday the 18th at the same place. 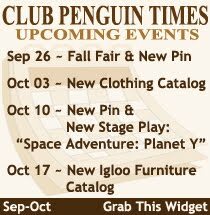 Make sure you look out for my buddies on club penguin. My brother 9elvis8, my best friend olemiss100, my friend vols105, and my online buddy, tooly228. All of us are on icepalace most of the time except for tooly228. He is usually on fjord. I have had my 100 hits! I will have a party for this event! Due to my personal events I will have this party July 26 on Ice palace 7:30 cpt at the dojo! Thanks ALOT!!! I am truely sorry. I used my friend tooly’s pitures and didn’t give him any credit. I have taken them off my site and I give tooly all the credit for the pictures. My very good friend tooly228 is having his 85,000 hits party soon and I have decided to help him out. I hope you have alot of fun!! !